A scathing indictment of America's failure to keep up with other advanced nations and to achieve its own most cherished goals. The chapters of the book focus on: the media, the economy and corporations, foreign assistance and military affairs, health and health care, education, crime and punishment, the environment, inequality, and more. This is the one book to read this year about current events and the United States' many recent failures, which have demoted them to the status of a second-rate nation. The book will be useful for policymakers, journalists, teachers, students, activists and public speakers, and anyone with an interest in the U.S. today. 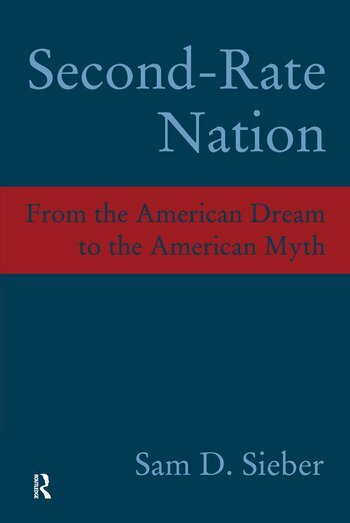 Drawing on copious international and domestic evidence, the author shows that America lags significantly behind other advanced countries in such domains as health care, education, crime, civil liberties, racial and ethnic equality, environmental protection, foreign relations, and key features of the economy, including persistent poverty. The gap extends even to some surprising areas: press freedom and democratic representation. Sieber examines the questions of how and why the peculiar gulf between America's extraordinary self-esteem and the true state of affairs has evolved. He is concerned with understanding how the nation's idealized self-image is sustained in spite of overwhelming evidence of impairment in almost every important domain. In an election year the book is a valuable resource for assessing the challenges the U.S. faces. Apart from the author's powerful thesis, the book is a rich compendium of up-to-date statistical data on a variety of issues, presented without either technical obfuscation or oversimplification. It should therefore be useful to policymakers, journalists, commentators, teachers, students, activists, public speakers, and anyone wishing to know more about the true state of affairs in the U.S. today. Introduction; 1. Overview of an Inferior Nation; 2. The Economy, Work, Recent Federal Budgets and Business and Government; 3. Health, Health Care and Costs; 4. Education; 5. Crime and Punishment; 6. The Environment, Energy and National Resources; 7. Foreign Affairs - Selected Issues; 8. Inequality of Blacks and Other Minorities; 9. Civil Liberties; 10. The Media and their Relationships with Corporations, the Government and the Public; 11. Democracy; 12. Conclusions and a New Beginning; Notes; Index.